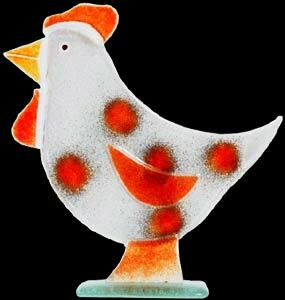 Introducing Amber Hen, Pink Spot Hen and Red Spot Hen from the Farmyard Friends Fused Glass Collection. Perfect gift for chicken lovers! Farmyard Friends Fused Glass Collection by D&J Glassware. Lovingly hand crafted by glass artists each individual piece is a beautiful work of art. The highest quality glassware in original designs in vibrant colours. Farmyard Friends make the perfect gift for friends and family on all occasions including Christmas, Birthdays, Valentine's Day, Mother's Day, Father's Day, Friendship Gifts, Thank You Gifts, Leaving Gifts and Anniversary Gifts!